Essential oils must be diluted in a carrier oil if used on the skin (this includes dogs). Exceptions are lavender and tea tree, but save this use for emergencies only, as continued use of an EO neat on the skin could cause intolerance to develop. EOs are powerful in small quantities and are not to be taken internally unless under direction of a professional. Keep your oil in the dark glass bottle it arrives in, stored away from heat and light, and away from children and pets. If you are not sure how to use essential oils, please email me, I would be happy to assist you. Always buy pure essential oils from a reputable seller whose main interest is Aromatherapy and who has been professionally trained in the use of essential oils. If an oil has been adulterated (often stretched with a synthetic oil by commercial vendors) it will have lost its therapeutic value. 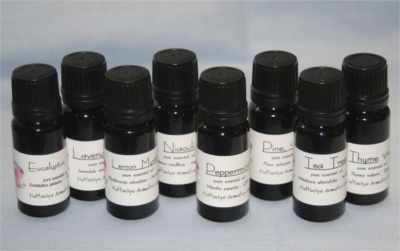 Caution is advised if you are pregnant, have epilepsy, or urgent health conditions, consult your aromatherapist. If you intend to use any essential oils for medicinal purposes, please consult a qualified aromatherapist. Never use only one oil continuously, you may develop a reaction to it over time, and it is much more effective to use a blend of essential oils called a synergy. Never use directly on cats ... over time it could be fatal, due to their inability to process essential oils through their particular type liver. Botanical Name: Eugenia caryophyllata th. Botanical Name: Myrtus communis m.
Botanical Name: Citrus aurantium aur. Thyme Linalool is the most gentle variety of Thyme EO. I do stock other varieties, but this is the one I recommend to be safely used by non-professionals. Recommended for the treatment of infectious skin diseases. Disinfect and heal oozing rashes from poison ivy, etc. as well as other contact dermatitis. Botanical Name: Thymus vulgaris Linalool. Please inquire if you do not see what you're looking for on this page. Due to the nature of natural materials, there will be slight variations between oils from one lot to the next. Different soil and weather conditions will slightly alter the appearance and characteristics of essential oils. These natural materials are commodities, and are subject to the whims of nature and the marketplace. Their prices can and do change without notice. 30 ml = 1 oz. 10 ml = 1/3 oz. 5 ml = 1/6 oz. 3 ml = 1/10 oz. 1 ml = 1/30 oz.